Now, I’m assuming you would like to get some professional photos done of your Queenstown Engagement. If I’m wrong about this, skip this step and read on. Ok great, you’re still with me. The reason I start with finding your Photographer as Step 1 is not because I think the whole world revolves around Photography. (Although…). It’s just that, if you want some professional photos taken of your Proposal, the planning will have to take into consideration your chosen photographer. Especially if you want the whole thing to be a surprise. So Step 1 is to find a Queenstown Engagement Photographer who is right for you. Obviously, start this search in the way everybody pretty much starts it. Hit up Google. Ask anybody you know (and like) who has had a Queenstown Engagement Session. Use Tarot cards etc. Then pick half a dozen or so Photographer’s you like the looks of out of everyone you’ve seen. Email them all but make your email personable. Tell them a little something about yourselves, give them a glimpse into who you are as people. (Don’t be nervous, they can’t force you to buy anything by email). Getting to know your potential Engagement Photographer and letting them get to know you is a very important part of the process. It will help you to figure out which photographer might be the right man/woman for the job. And for the Photographer you end up booking, the better you know each other the better your Engagement Photos will be. This is mostly because you will feel more comfortable with them. Also, this way your Photographer will have more of a sense of who you are as people and can shape the shoot accordingly. Right, you’ve found your Dream Queenstown Engagement Photographer. (Good work you!). Now, hopefully you actually trust them! (You are asking them to photograph one of the most important moments in your life after all). 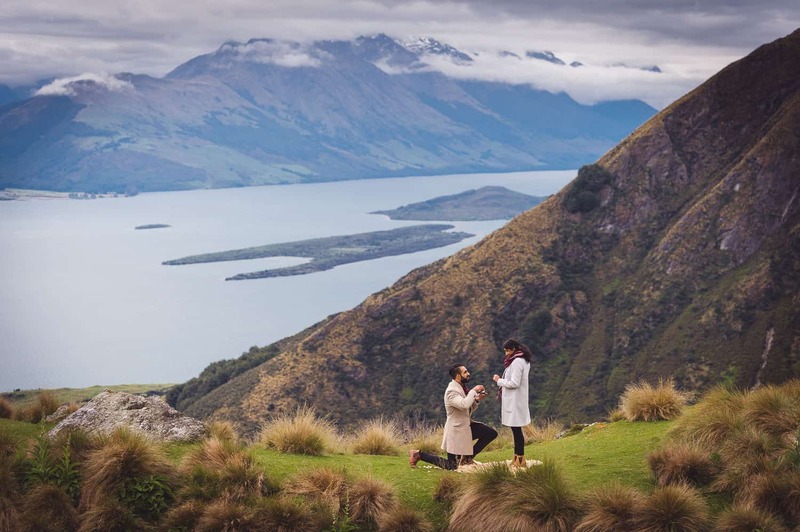 So if you trust them, trust their knowledge and experience and pick their brains on how best to pull off The Most Romantic Queenstown Proposal Ever. Now that’s not to say you can’t plan your Proposal your way. Of course you can. But it would be foolish not to ask the opinion of somebody who is a Queenstown local and has a tonne of experience with Queenstown Engagement Photography. Now this Step all depends upon the exact nature of the Queenstown Proposal you are planning. But, generally speaking it can be hard to have your Engagement Photographer close enough to capture the moment you propose without being seen. So, your best bet is to hide your Engagement Photographer in plain sight. Get somebody else to propose a completely different kind of Photo Shoot. Eg get your mum to give you two a gift voucher for a Couples Photoshoot while you are in Queenstown. Or maybe you can tie your Proposal in with some sort of guided tour or adventure tourism activity. And then your Engagement Photographer can pretend to be the official photographer for the group. Or perhaps your Photographer can pretend to be just another guest on the tour. A guest who is a serious amateur photographer. If you’re planning a Queenstown Heli Engagement then you can tell your fiance-to-be that there will be some other guests on your flight. Just say that the other “guests” are from a previous flight that got cancelled and they got bumped to your heli flight. STEP 4: GET DOWN ON YOUR KNEES – AND STAY THERE! Now you may think it’s silly or old-fashioned or both to get down on one knee to propose. But I, for one, think it’s incredibly romantic. And more importantly, the photos of you down on one knee are the only photos that shout out to the world “I’m proposing!”. So I suggest you do the down on one knee thing. And when you do get down on one knee, stay down there for longer than you think is necessary. I would recommend 20 seconds at least. If your now-fiance kisses you while you’re down on one knee even better! (Don’t worry, there will be more kisses later when you’re standing). (I mean come on – what good plan doesn’t involve a secret code word?). So, you’ve managed to get your fiance-to-be to where you plan to propose. Your Photographer is there and your partner hasn’t figured it out. Your photographer is nearby, maybe even with camera in hand pretending to be an amateur photographer. But your even if your photographer is posing as a photographer, unless your cover story is a photo shoot involving you they can’t be shooting or even looking at you two the whole time. So it’s helpful to have a secret code word, gesture or signal that will let your Photographer know that a proposal is about to go down. Or just agree on timing before-hand. Eg “I will drop down to one knee 5 minutes after getting out of the helicopter once the pilot has walked us over to a good scenery viewing spot”. This one is care of this Blog Post on www.howheasked.com. Right, hopefully this Blog Post gets your creative juices flowing and helps you plan your Queenstown Engagement Photography. If you need any more info or advice or you’d like to know about my Queenstown Engagement Packages, get in touch via my Contact Page. Alternatively you can email me at patrick@fallon.co.nz or give me a bell on +64(0)231737356. The 58 Most Romantic Ways To Propose – by theknot.com. How To Pull Off The Perfect Photo Shoot Proposal – by howheasked.com.